The reasons why you should hire a professional garage door installer and this recent repair we did is a great example of why. Our customer’s Wayne Dalton Garage Door suffered a crack on the upper panel because of the botched installation. When the friend installed the opener, he didn’t add a strut to reinforce the upper panel. 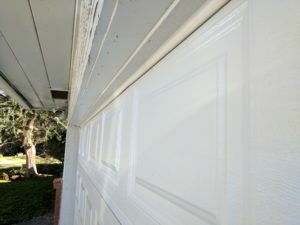 This resulted in a crack on the upper panel when the garage door began operating. You can see in the photo above where the crack formed. Above is a close up of the crack. 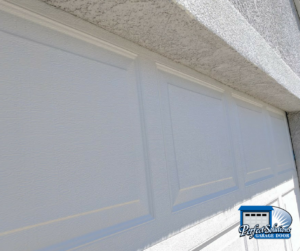 Cracked panels are a big deal and can compromise the safe operation of your garage door. Once we took the garage door down, we were able to see the extent of the crack. The picture above shows the crack close-up. 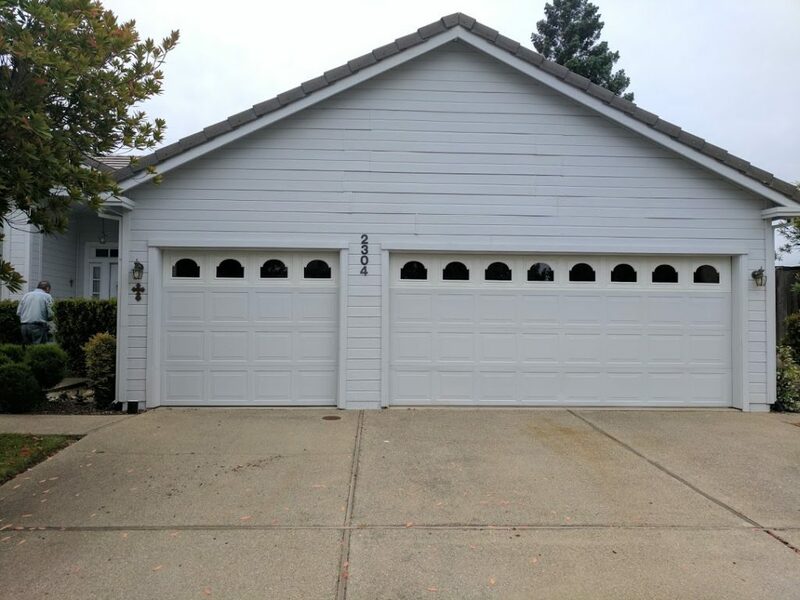 Thankfully, this Wayne Dalton garage door wasn’t a discontinued model and we were able to order a new upper panel. Once it arrived, we removed the cracked panel. We also, of course, added a strut this time. 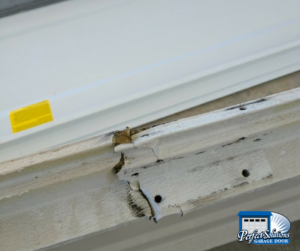 The strut will reinforce the upper panel and prevent cracks from happening in the future. We also adjusted the tracks while we were there and performed a quick visual inspection to make sure the springs, cables, and other garage door parts were working properly. Above you can see the brand new strut we installed. And above, the new panel is installed, with no cracks to be found! As you can see below, garage door cables come in all different sizes. There is of course a logical reason for this. 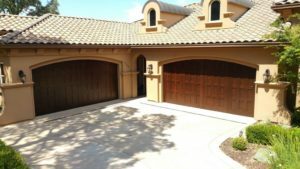 Every garage door is a different size and weight, and needs a cable that suits the particular garage door. 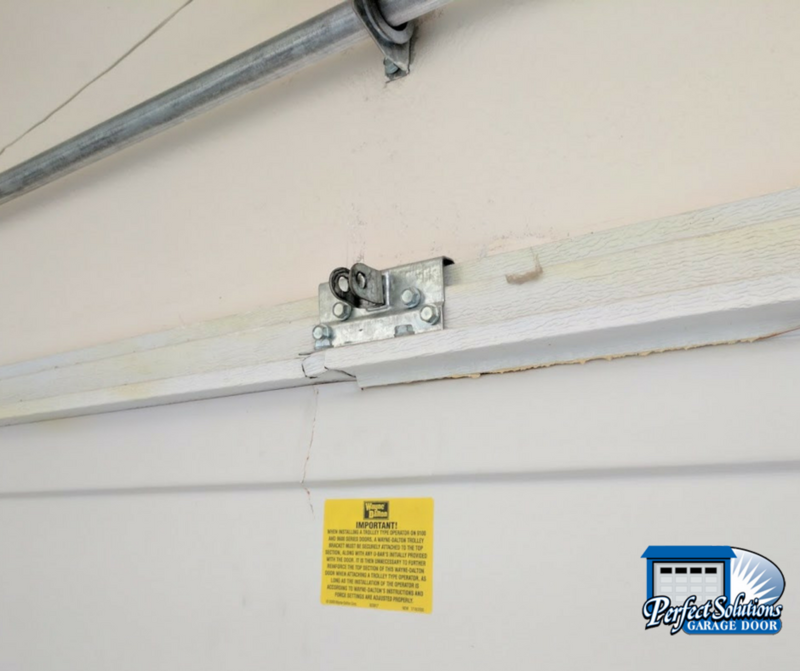 Unfortunately, many repair jobs that we do are caused by garage door cables that snap, or cables that break. 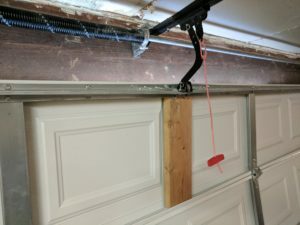 How to garage door cables work? Cables help to reduce the tension garage extension and torsion springs. A properly sized cable will help to extend the life of your springs. Cables also help your door open and close more smoothly. A common garage door problem and repair call is a broken spring. 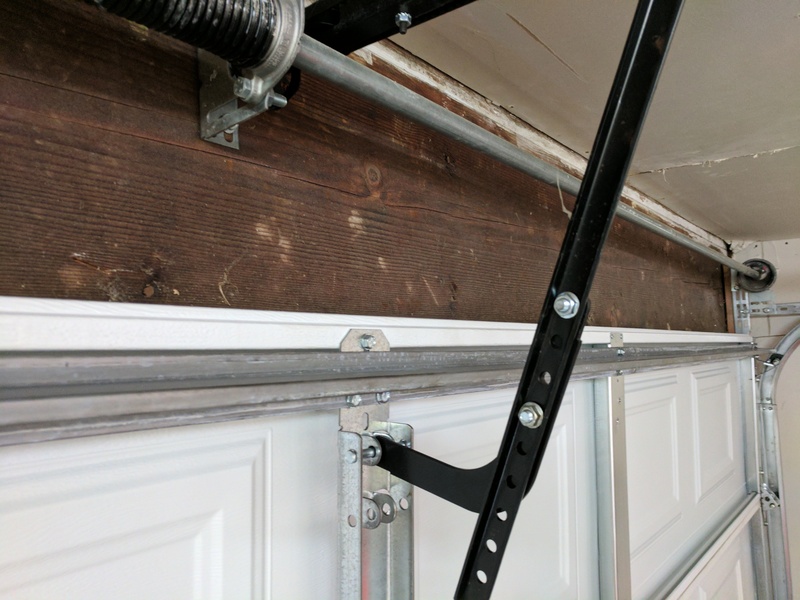 When a spring breaks, your cable plays a vital roll in making sure your garage door doesn’t fall down once the spring breaks. How thick should your garage door cable be? 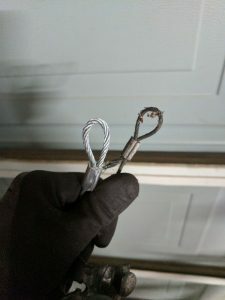 Thicker isn’t always better when it comes to garage door cables. Thinner cables can wear down more quickly, and therefore break or snap faster than a thicker cable. But it really is all about finding the right balance with the size and weight of your door. 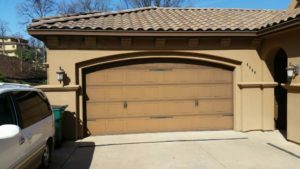 Thicker cables can obviously support more weight and tension, so the heavier and bigger your garage door is, the thicker your cable will be. In the picture above of the two cables, you see the spot where cables most often will snap. The new cable is the one on the left and you can see it’s thicker. But again, thicker doesn’t equal better. 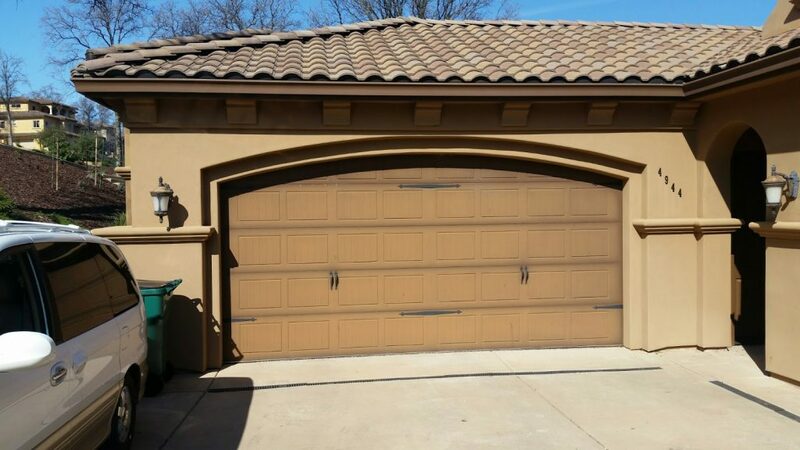 It’s best to have a professional garage door tech inspect your door and determine what thickness fits your specific door. It is possible that a cable can be too thick. In this case, your door will be harder to open since it won’t glide over your pulley and drums easily. 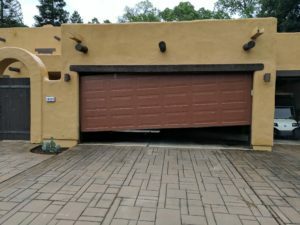 The goal is to find a cable thickness that works in sync with the size of your garage door springs, and the weight of your door. When sizing the cable, remember that the gauge of your cable is the thickness, so a higher gauge is a thicker cable. Nic and Malinda recently purchased their first home together. As part of a long list of projects they wanted to tackle, they took to upgrading the outside of their home. 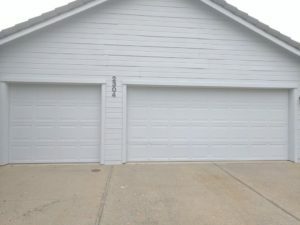 This included minor jobs like new paint, minor repairs, and of course, a brand new garage door. 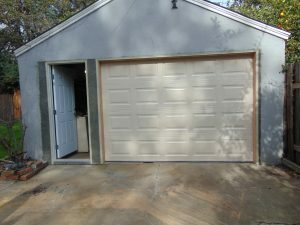 The garage door that came with the house was in OK condition but lacked character and just wasn’t their style. 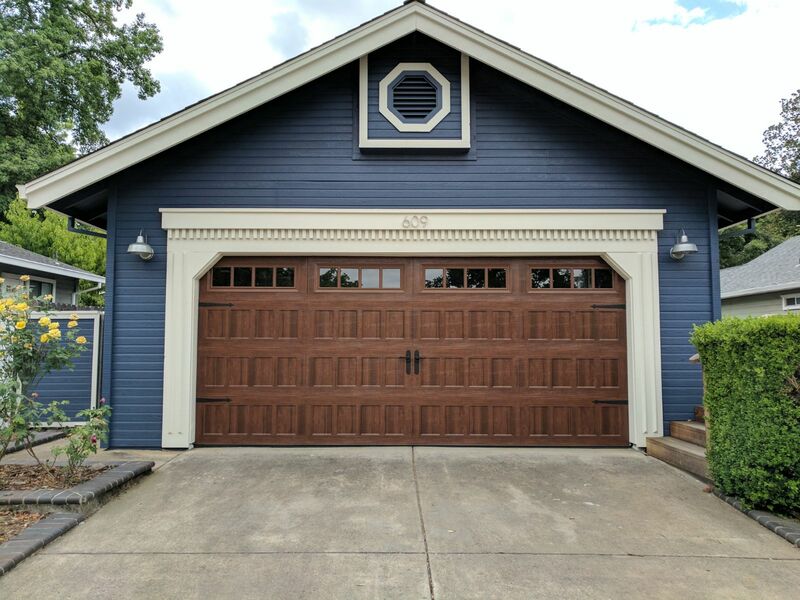 And with such a bold exterior paint color and style to their home, they needed a garage door that could stand up to the rest of the house. 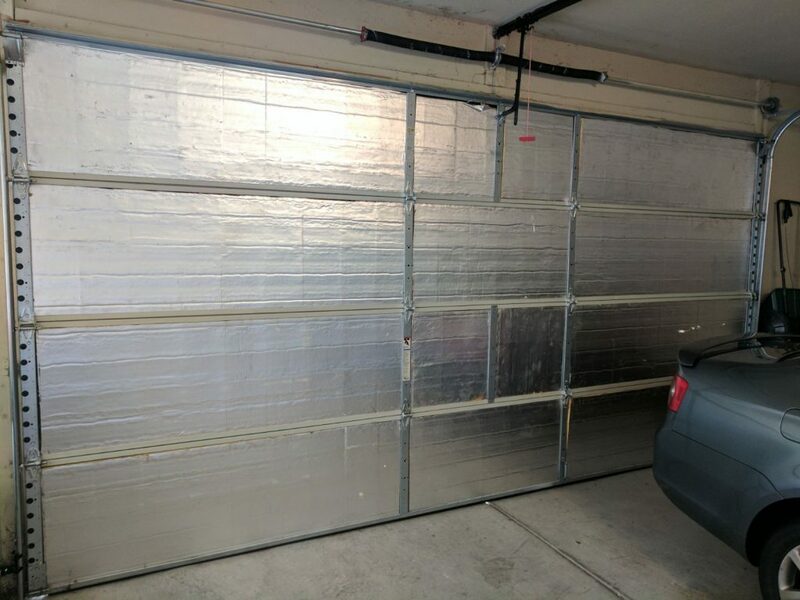 They called Perfect Solutions to help them land on a garage door that would meet their needs! 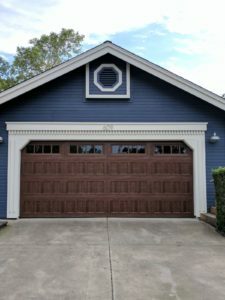 After looking at many garage door options on the market, and figuring out what style of door they loved most, Nic and Malinda went with a gorgeous Walnut finish door. They chose the Oak Summit 1000 model by Amarr. The door they chose include a recessed design, Thames windows, with a walnut finish. 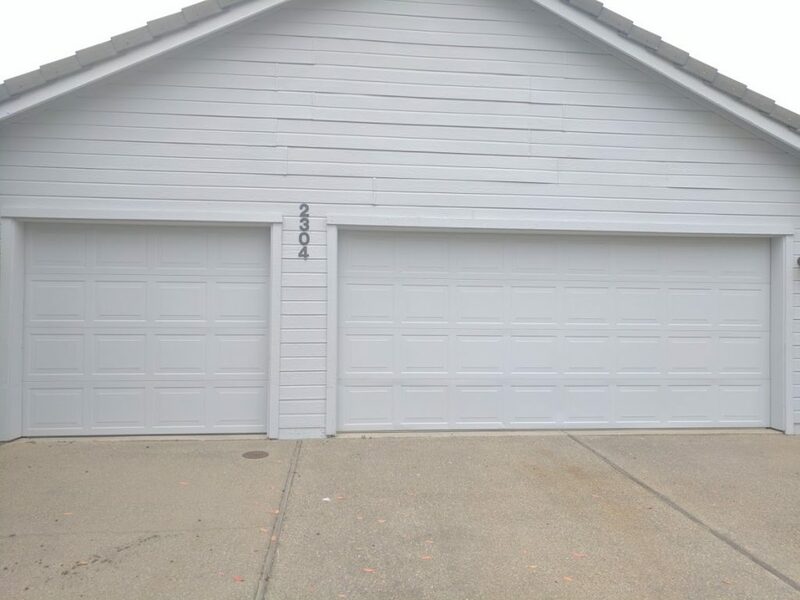 Part of the garage door update also included a new garage door opener as well. 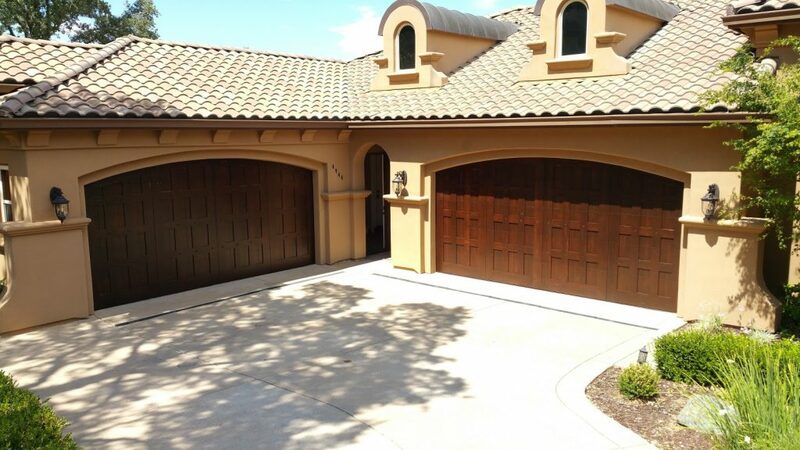 They chose a LiftMaster Screw Drive 1/2HP opener, which is quiet and a perfect compliment to their beautiful door. 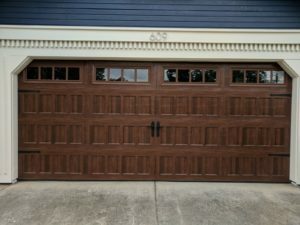 Amarr’s Oak Summit doors are also insulated, a great feature when in the market for any new garage door. Not only does this help in temperature regulation, but coupled with Nic and Malinda’s new LiftMaster opener, makes for a much quieter door as well! 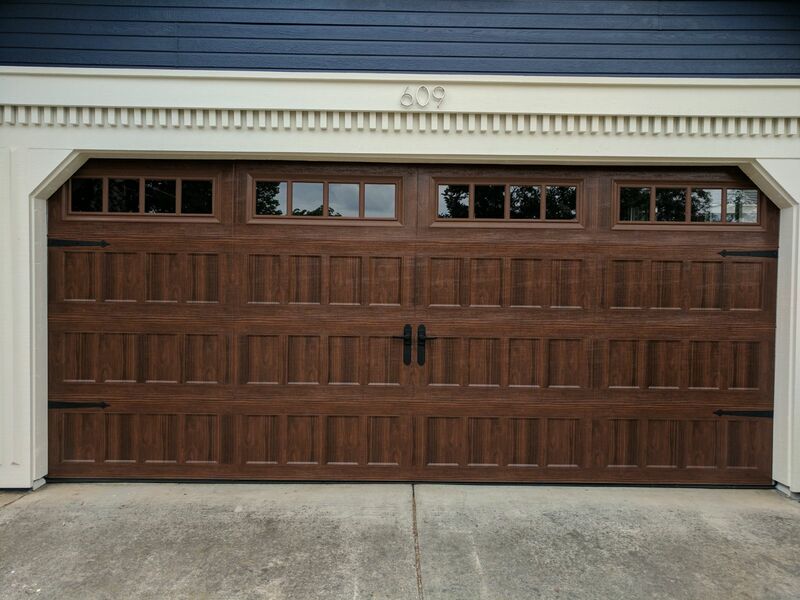 The Amarr Oak Summit door is a great choice for the budget conscious garage door shopper! They are known to be one of the most affordable carriage house garage doors on the market. This model is a metal carriage house garage door. Metal is a great alternative to it’s more expensive counterpart material, wood. Metal is also low-maintenance compared to wood. This Amarr door is not only affordable, it comes with over 70 design options, so style, options, and affordability can all be achieved! A few weeks later, we headed back out to this home to install the hardware they ordered to accompany their new look! We think it looked great without, but it looks amazing with these accents! Our latest project included saving a beautiful classic car from destruction! Ok, so it was really about fixing an off track garage door that a beautiful classic car happened to be parked in, but we like to think of ourselves as heroes! Mike and Suzy called and said their main garage door went off it’s tracks and some rollers and cables had fallen off the door. When we arrived we found even more problems. The opener needed adjusting, the size of the springs were wrong and the cables were bad. The challenge was completing these repairs and getting the door back on track without disturbing their amazing car! The garage wasn’t huge, so working around the car was tricky. The first thing we did was level the door. We then put the rollers back in the hinges. Once that was done, we were able to remove the tension from the old springs. With those tasks checked off, we replaced the cables with heavier gauge cables that are the right thickness for this door. Then we installed 2 properly fitted springs, that will carry the weight of the door correctly and support the opener. The door also had a cracked upper panel. 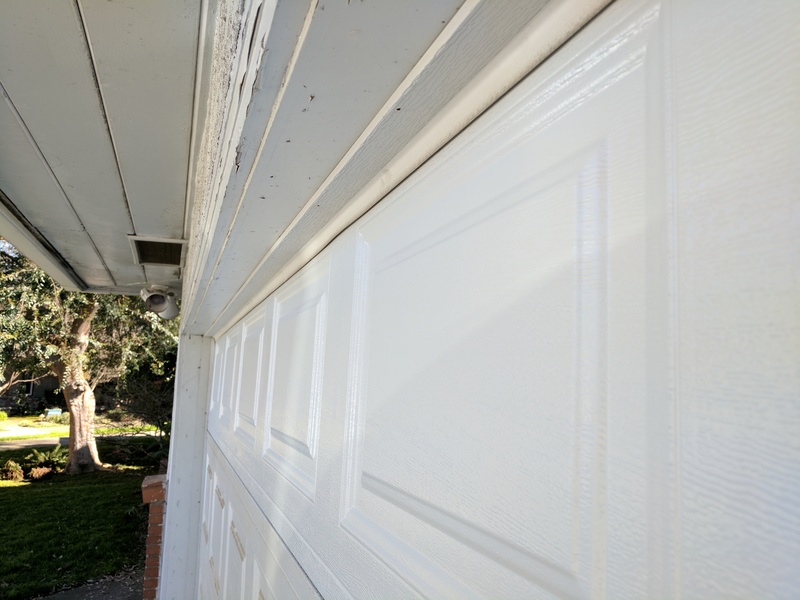 Since this door had been discontinued and we couldn’t order a replacement panel, we installed a 16′ strut for reinforcement, as well as a center style mount to mount the opener “J” arm. The last fix was adjusting the opener. We noticed during the initial inspection that the opener installer had adjusted the force to the maximum. This isn’t good since it opens and closes too forcefully and can cause the door to come crashing down. This was a good reminder to get a professional to set your force properly. 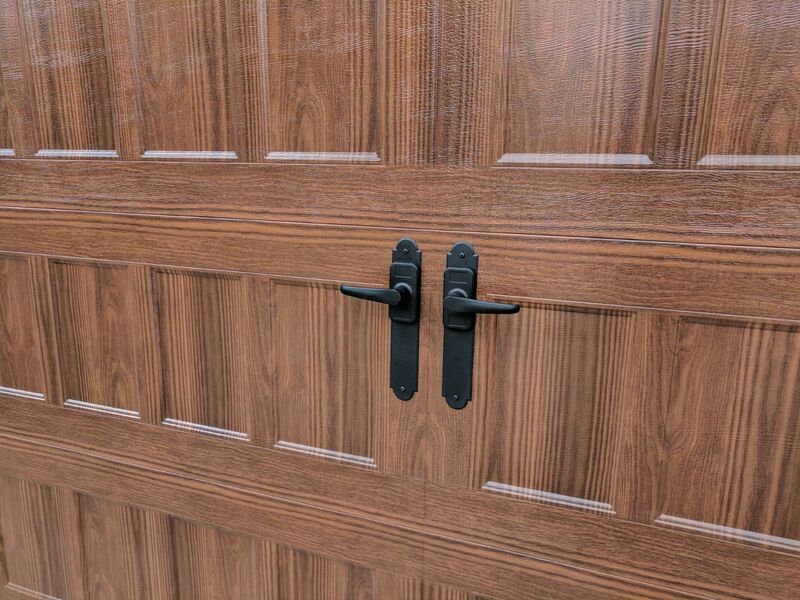 The setting will depend on the weight of your door as well as the type of door you have. And now, Mike and Suzy are ready to rock and roll! 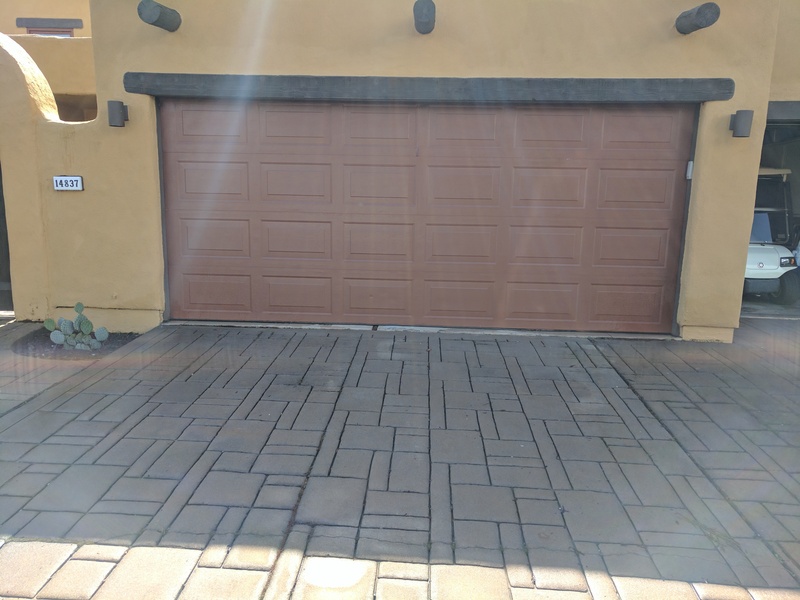 We got a call from a customer last month that their garage door wasn’t opening all the way. Naturally, they were very annoyed and wanted to resolve the issue. Perfect Solutions to the rescue! We were able to get out to their house same day and fix the problem! When we arrived at our customer’s house we began the process of troubleshooting all the potential issues. The problem ended up being the heaviness of the door and the opener. The door was too heavy for the opener to properly open and close the door. 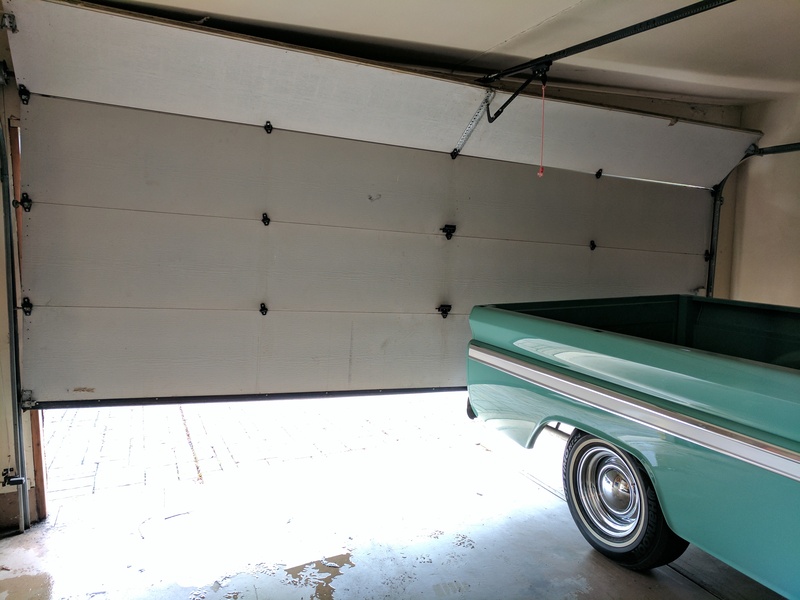 The door was too heavy because the torsion springs that were installed are too small for the garage door. 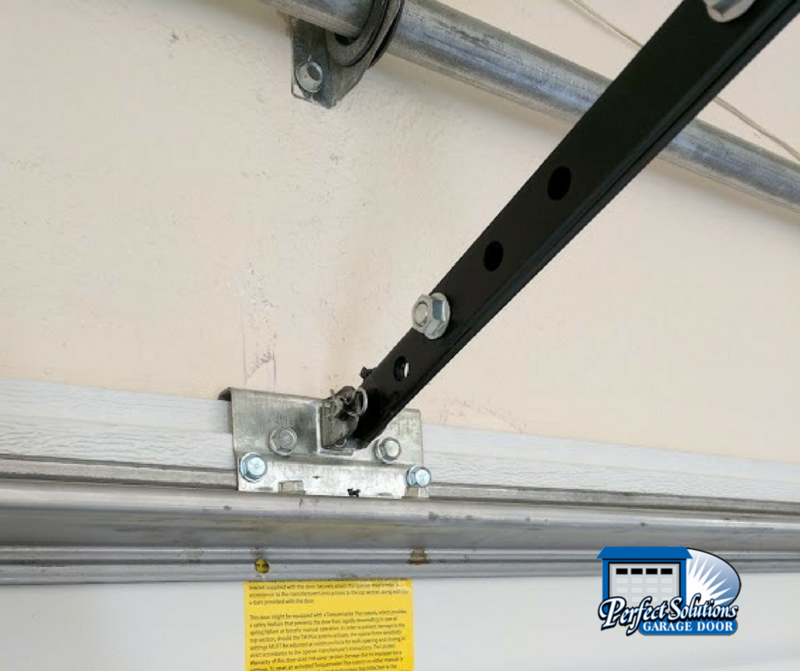 Sizing your springs properly really do make a difference in the proper functioning of all of your garage door parts! In the video below, you can see the results of installing the right size torsion springs. Now the door opens and closes all the way! You can see in the video, we not only replaced the small torsion spring, but we installed a new dual spring system as well. 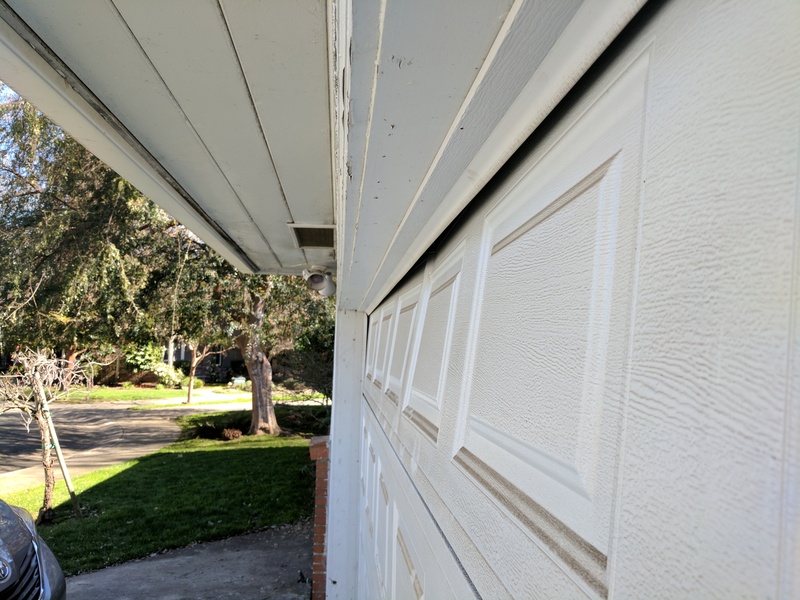 Not only is the dual spring system more durable and stronger than 1 spring, it will increase the longevity of your springs, your opener and all the other working parts of your garage door. 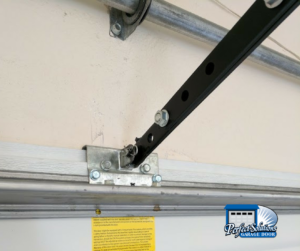 There aren’t many cases that we don’t recommend installing a two spring system for your garage door. It costs a little more upfront, but is worth it in the long run. Springs are important, not just the right size, but the number as well! Now our customer is happy since his garage doors are opening and closing as they should. Another satisfied customer! We recently completed this awesome project in Midtown, Sacramento. 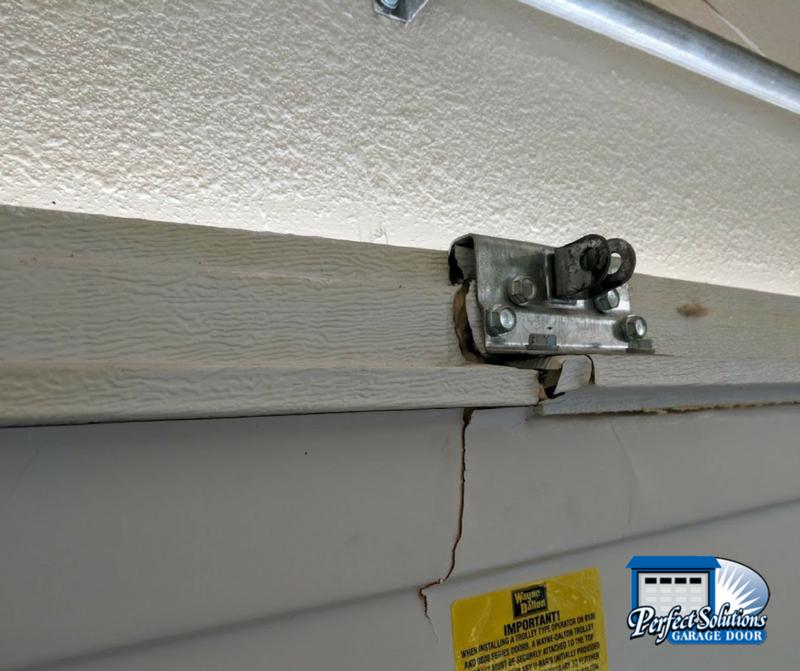 Our customer’s old stand alone garage door had a rotten wood garage door that only opened manually, and barely opened at that. 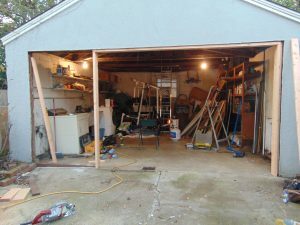 He wanted to use his garage for it’s intended function. 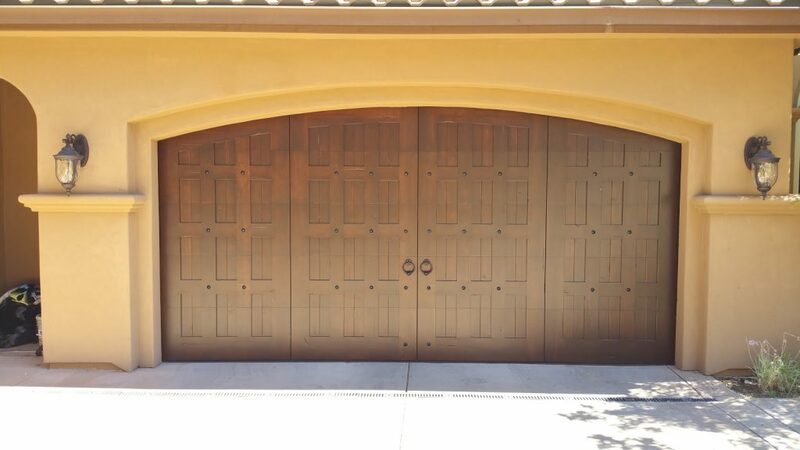 That meant he wanted to remove those old wood doors and install a brand new garage door and garage door opener. 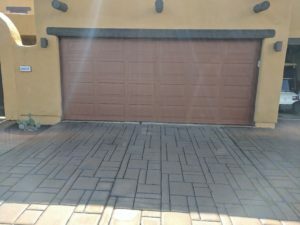 He also wanted to add a walk through door so he could access the garage without having to open the big door. The project began with demo! 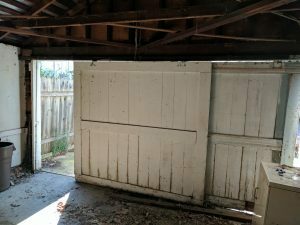 We removed the old rotten wood garage door. All of the framing around the old door was in a bad shape and rotting as well. So we got to work removing that and just generally cleaning up the space to prep it for the construction. Once that was done, we were able to re-frame the opening to properly fit the garage door we chose, as well as frame out the walk through door. Once we completed the framing, we were able to install the brand new walk through door! Looks great, right? 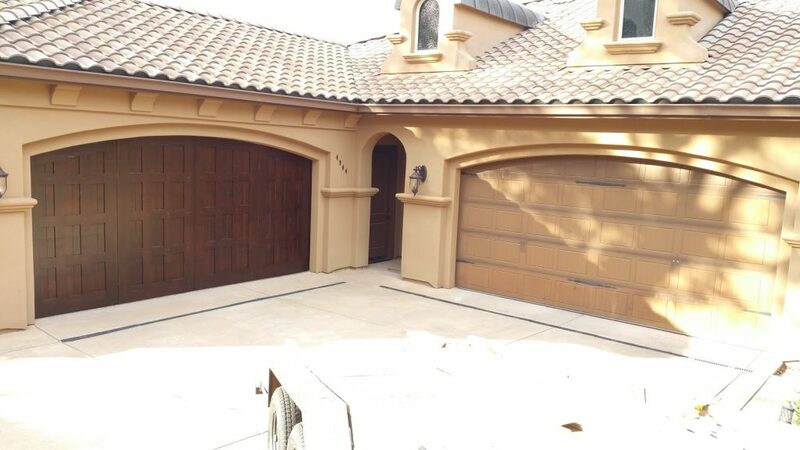 The last part of the project is of course the most dramatic, the installation of the brand new door! 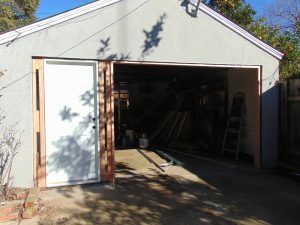 The door he chose is a great door, and we also insulated it to help with temperature control in his garage. Once the door was installed and looking good, last step was all the finishing! 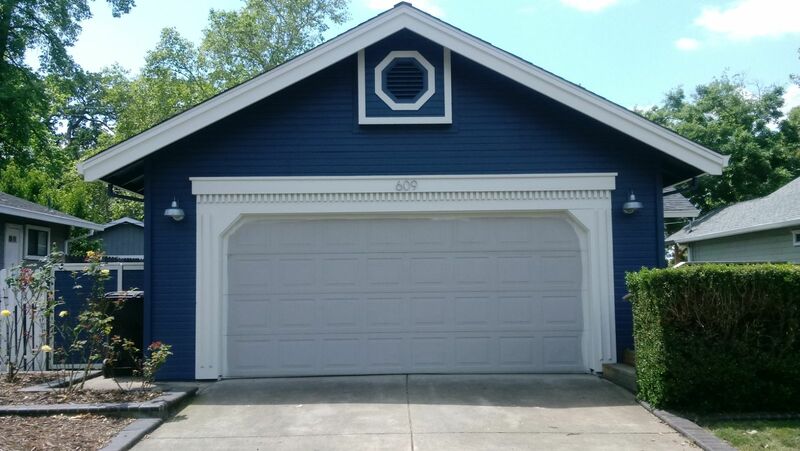 We textured and painted the exterior. Lastly, we installed the garage door opener to make this baby go up and down with ease! Our customer chose the LiftMaster 8550W opener. 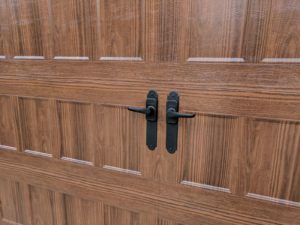 The opener has some great features including WiFi connectivity so you can control it with your tablet or smartphone.